daily life and work If you have noticed any of the items above in your loved ones, a Memory Care community could be a great option. The The Terraces at Abiitan offers a comfortable community atmosphere where seniors can receive specialized care. Our Assisted Living and Memory Care community in downtown Minneapolis is dedicated to providing top care and support with all the comforts of home. Call us today at 612.293.0956 for you and your loved ones to come visit our community. As our parents age, hard conversations are just that- they’re hard. Being proactive and starting the conversation sooner rather than later, and involving them in the conversations that shape their plans for the future, puts everyone ahead. Here are a few suggestions to start with: 1. Ask them how well/often they can do certain daily activities? People who are able to live independently should have no trouble completing daily tasks such as grocery shopping, cooking, doing chores, paying bills, etc. Letting your parents consider how often they need help with simple tasks, may help them realize it is time for a change. 2. Ask them about their vision for the future. Do they see themselves moving into a retirement community? The answer may be “eventually,” so help them put a time frame to their plan. This can help solidify plans and start the search for the right community and level of care. 3. Talk about mobility. Maybe they have trouble going up the stairs or getting out and about in the car—any issue with mobility can hinder the ability to complete daily tasks. It probably also causes you to worry about injuries or accidents. Let them know that Assisted Living and Memory Care communities can provide transportation and help with moving around—so they can get where they want to go again. 4. Come up with a crisis plan. Talking about potential crisis scenarios can help your parents realize that they may not be prepared to deal with a serious issue. Falls and accidents can be common among seniors, and sometimes it’s as simple as not having thought about getting to a phone to call for help in that scenario. Moreover, if they do suffer a serious health change, what are their plans if they need rehabilitation, support, or care as a result?Do you have concerns? Want more insight on starting these conversations? Join us on Dec. 11th for a Happy Hour and TED-type talk where we’ll discuss just that! RSVP Here, or Contact Us for more information. Did you know that more than half of seniors have reported that their biggest fear as they age is becoming a burden on their family? The vast majority also stated that they have not talked about their long-term plan with their loved ones. As your loved ones age, choosing an Assisted Living Community can actually make your family healthier & happier… here are a few ways how: 1. Safety and Security Checking in on your parents frequently? Assisted Living can be a huge stress relief. In an Assisted Living Community—like The Terraces at Abiitan—our staff is always ready to assist residents checks to make sure all of their needs—and wants—are met. We also equip our residences with emergency safety technology. 2. Flexible Care The Terraces at Abiitan offers an inclusive monthly rate—which means as your loved one’s needs change, their costs do not. We also offer Independent Living and Memory Care, which allow for seamles adjustment in their care levels as needed. 3. Opportunities to Continue to Grow and Learn The Terraces at Abiitan offers plenty of opportunities for residents to continue all of the things they love, and pursue new pasions. We plan a robust calendar of cultural, wellness, educational, and social opportunities.4. Embracing the Whole Family We know that when a family chooses The Terraces for their loved one, not only do we have a new resident—but we have a new family as well. We make it a priority to connect and communicate. Our door is always open and our community features shared community spaces for visiting and entertaining. Talking to your parents about Assisted Living can offer everyone peace-of-mind in having a plan in place. It is never too early to start thinking about the future. Assisted Living can provide the support, services, and amenities that you loved one needs to be comfortable—and that your family wants—to be healthier and happier. Whether addressing a loved one’s needs now or beginning to plan for the future, start with The Terraces at Abiitan. 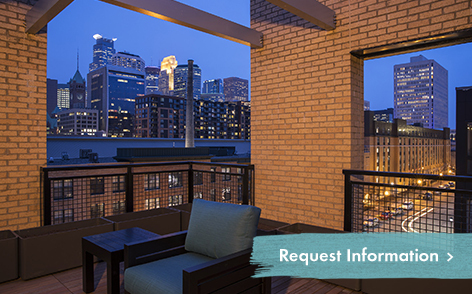 We are located in downtown Minneapolis so residents can experience the best of the city, as well as the best care possible. Call us at 612.293.0956 or visit us online today to plan a visit for you and your parents.